Civil engineers are in demand. According to the U.S. Bureau of Labor Statistics, employment of civil engineers is projected to grow 20 percent from 2012 to 2022, faster than the average for all occupations. As infrastructure continues to age, an increased number of civil engineers will be needed to manage projects rebuilding bridges, repairing roads, and upgrading levees and dams. 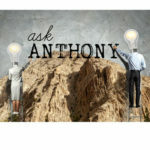 But what kinds of specific skills do you need to meet that challenge and boost your engineering career? 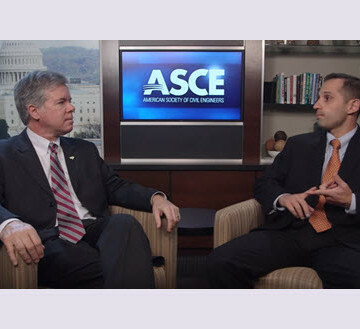 In this ASCE Interchange, Anthony Fasano, P.E., M.ASCE, founder of The Engineering Career Coach, discusses the must-have core skills you need to succeed in a civil engineer career today. Learned more in a few moments then some may have learned in a lifetime. Priceless! 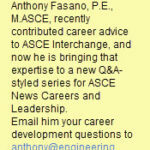 Excellent interview and very apropos in the current Civil Engineering mileu!